Remove chicken from oven & allow to cool slightly. While chicken is cooling in large pot heat up the gravy until heated through (I use dry gravy mix, but the jarred/canned stuff works great too). Drain carrots & celery and add to the gravy. Add parsley. 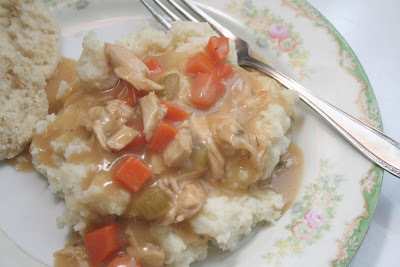 Pull apart or cut chicken into bite size pieces & add to the gravy. Stir it all up & serve over warm mashed potatoes. Enjoy! *This makes quite a bit of food. Serves about 8 people. *You can do this same idea with country gravy & ground hamburger- Hamburger Gravy.